1. 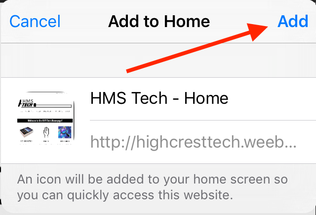 Open the HMS Student Handbook, then click the "Share" icon (box with the arrow) at the top of the screen. 2. Select the "Add Bookmark" option. 3. A confirmation window will appear. Tap "Add" to add the link as a bookmark.